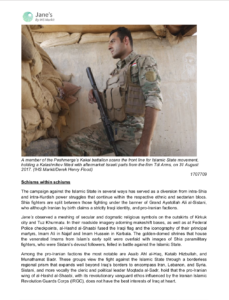 Erbil- I have a new article out for Jane’s Intelligence Review on the forces arrayed around what has come to be known as the ‘Hawija pocket’ in southwestern Kirkuk governorate. The traditionally Sunni Arab town of Hawija, a restive northern bastion of insurgency from 2004 forward, and its hinterlands acted as an accelerator of Sunni grievances when Iraqi security forces stormed a protest camp there in late April of 2013. The Peshmerga and their battlefield peer competitors in the Hashd al-Shaabi have been stuck in operational limbo as there has been no agreement on who would govern a post-IS Hawija once the smoke has cleared. The ethnic Turkmen stationed outside the town of Bashir (alt. Basheer) from the local brigade of the Badr Organisation withstood IS sniper fire at the time of my visit which they promptly answered with a Zu-23 anti-aircraft gun mounted atop a BTR-50 tucked safely behind a berm. Knocking IS out of Hawija will be more like Tal Afar than Mosul or ar-Raqqa. The armed groups surrounding the pocket just haven’t been able to come to terms on a battle plan. That should change very soon. 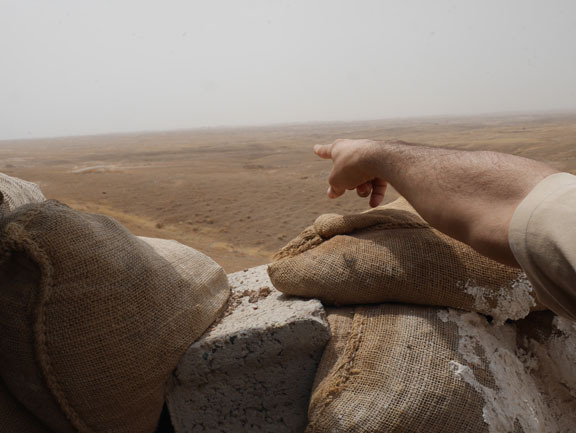 Hawija simply isn’t valuable enough for IS to continue to hold onto till the last man. It is more likely planning a salafi version of taqiyya (dissimulation) into the local population while it decides to regroup in the nearby Hamrin mountains.